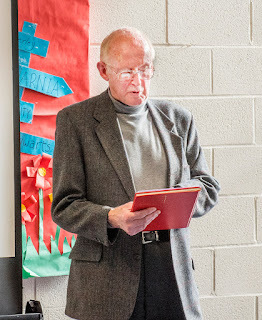 Angus Yeaman retired after almost 50 years of service as a committee member in various capacities and as the society's President for the last 8 years. 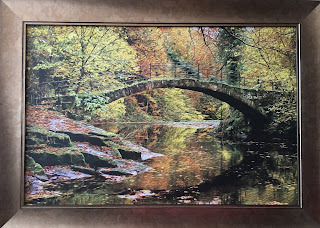 Although Angus was unable to attend the AGM, Arthur Procter gave him a beautiful photo which he took of 'The Roman' Packhorse Bridge and the Society had it framed to thank Angus for his outstanding contribution to the society. The Chairman, Gillian Postill, announced her retirement after serving on the committee for 12 years and in the role of chairman for 9 years. She spoke of considerable community work in relation to the Town Centre and Marple Wharf and development of the Society's planning system, as significant activity during her chairmanship. She thanked committee members, past and present, for their support and hard work. 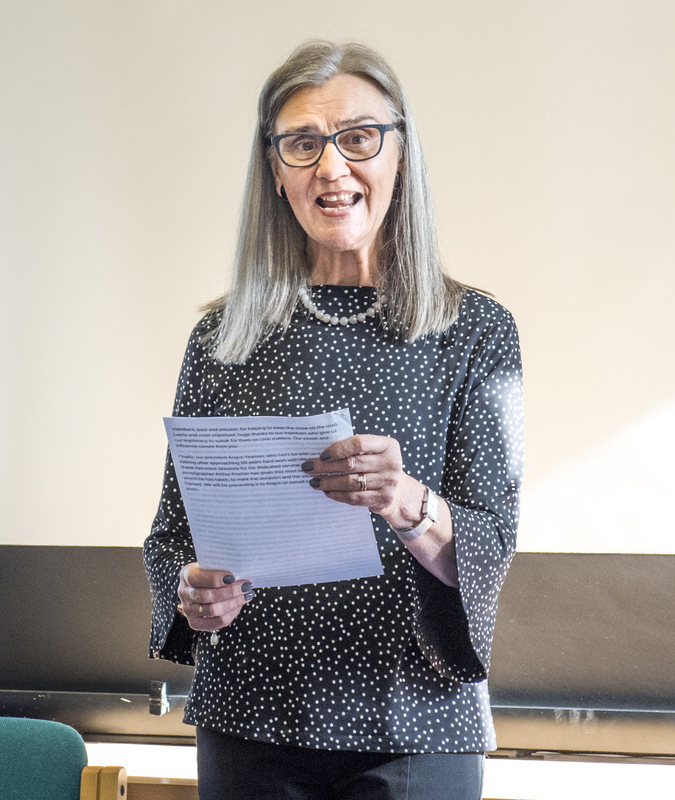 Following the Business Meeting, Gillian led a presentation to address the future of the society in light of four committee members and the membership secretary retiring this year. 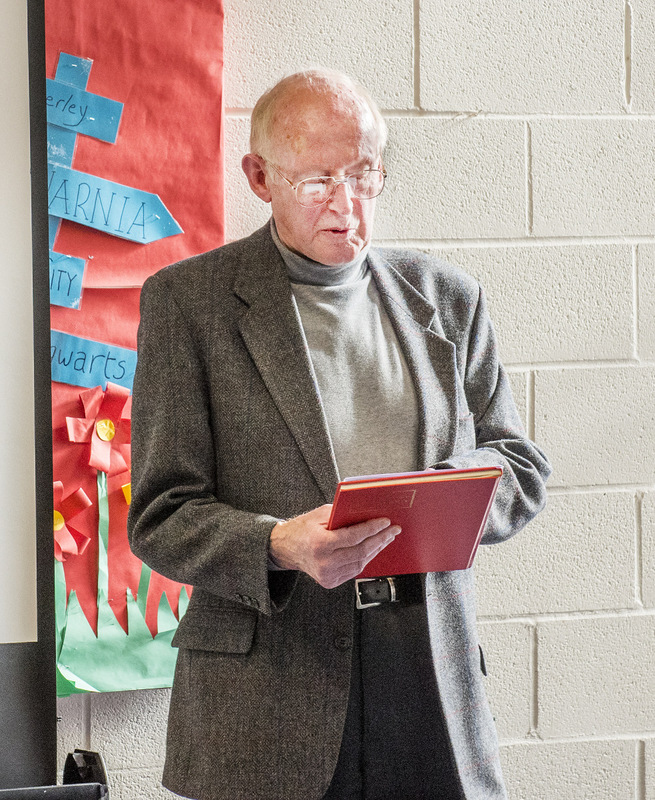 Treasurer Gordon Johnson talked about the varied projects the society has been involved in, demonstrating the wide scope of the society's work. Planning co-ordinator, David Cooper, explained how the society now works in a systematic way in dealing with planning applications. 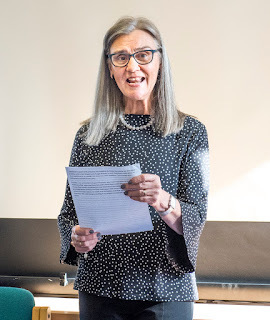 Gillian explained that the society was in a good position - a healthy membership, a secure financial position and well respected for the way it functions from a knowledgable evidence base. The Society is ripe for new blood to get involved to build on the past and take it forward. Those present at the AGM were in no doubt that the society should continue - but that will only happen if volunteers come forward. Gillian said: "working for Marple through the Civic Society is one of the most exciting and rewarding things you can do - and you don't have to be a 'professional' - I'm a nurse but I love Marple and I love people - that's all you need to succeed"
"The Future of Marple Civic Society"
Does Marple need a Civic Society? - How should it function? - What should it do? - Who will do it? There is no charge for this workshop and everyone is welcome - you don't have to be a member of the society to attend - all are assured of a warm welcome..
Four members of the committee are retiring this year after many years of service. Please join us to discuss the Future of the Society - to decide how we can move forward and build on the strength the society has built up over the last 10 years. If you can't make the AGM come along to the evening workshop on Monday 15th April to discuss the same issue. Ian Harvey, Director of Civic Voice - the national civic movement for England and Wales - will be joining us to help facilitate the evening. We hope to see you at either the afternoon or evening event. We are keen to give everyone an opportunity to share their views and ideas. You don't have to be a member to attend; if you care for Marple you will be very welcome. 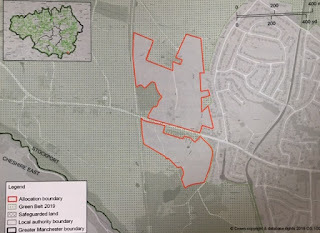 The proposed development in High Lane (GMA38) plans 500 houses - supposedly suitable for elderly people - on a greenfield site along the A6 on the edge of High Lane Village. This is very odd logic. There is a need for suitable accommodation for older people but it should be in the village centre, not on the edge of the village where public transport is inadequate, there is no social connection and the only means of accessing the local doctors, shops, village hall, library, other than by car, is a dangerous, unpleasant uphill trek along the A6 which already has high pollution levels and congestion, made worse recently following the opening of the A555 link road from the A6 towards Manchester Airport. 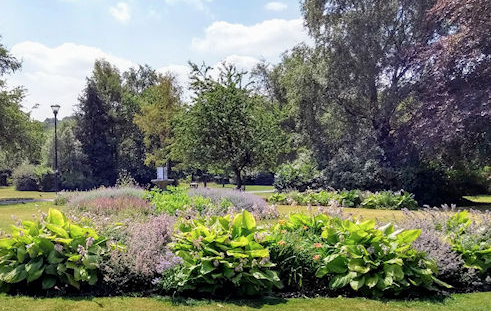 We recently attended a meeting with Manchester Mayor, Andy Burnham, arranged by Cllr Blair for 'Save Stockport Green Belt (SSGB)' and other High Lane community Groups. The Mayor listened and was receptive to suggestions. 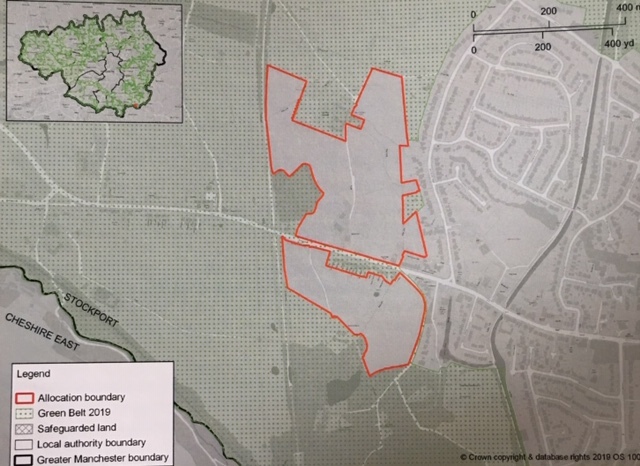 We explained that it is possible to avoid building on Greenbelt land by either using the most recent housing projection figures (the Government and GMSF continue to use out of date ones) or by reducing the length of the plan to 15-17 years. Both are political choices so we hope the politicians will make the right choices to avoid building on Greenbelt. Alternatively, use the SSGB questionnaire, prepared by Cllr Blair, or visit us in High Lane Village Hall tomorrow from 10.30 - 2.30pm - questionnaires will be available and we will be helping people to complete them. 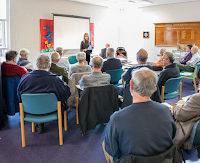 AGM - followed by: Presentation & Discussion re "The Future of the Society"
"The Future of the Society"
Four members of committee will be retiring this year after many years of hard and dedicated service. 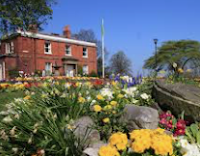 There is no doubt that Marple would be a poorer place without a Civic Society but we are at a cross-roads - how does the Society go forward and build on the strength it has built up over the last 10 years? This is what we will be addressing at the AGM. If you can't make the AGM there will be an opportunity to come along to an evening workshop - details available soon - we want as many people as possible to help us to decide the "Future of the Society"
We have an opportunity to recruit new blood wth fresh ideas to reinvigorate the committee and the society - find new people with energy and enthusiasm to take forward a dynamic and thriving society that will continue to stand up for Marple. But how do we do that? We need your help to find the answer. Please join us - you don't have to be a member - if you care for Marple you will be very welcome. 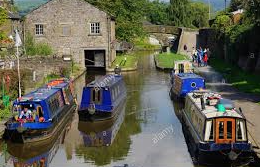 The Marple Wharf planning application was heard at Marple Area Committee last night. We are delighted to report that our local councillors refused the applicatioin to develop the site. Five councillors voted to refuse the application and one claimed prejudicial interest. Of course, the wharf cannot be left as it is - it needs to be developed and cared for - the Civic Society has campaigned for 10 years for a mixed use scheme commensurate with its heritage status and including community facilities. We hope that Canal & River Trust will contact the community soon with this in mind.